In 2016 I was asked by Pierce County AIDS Foundation to design a logo for a new community engagement and fundraising event, call Unwind. The purpose of the event was not only to serve a fundraiser for PCAF, but also as a chance to hear updates on the important work being done by a local organization. The event has a happy hour type atmosphere that allows supporters of PCAF to relax, socialize, and yes, unwind. 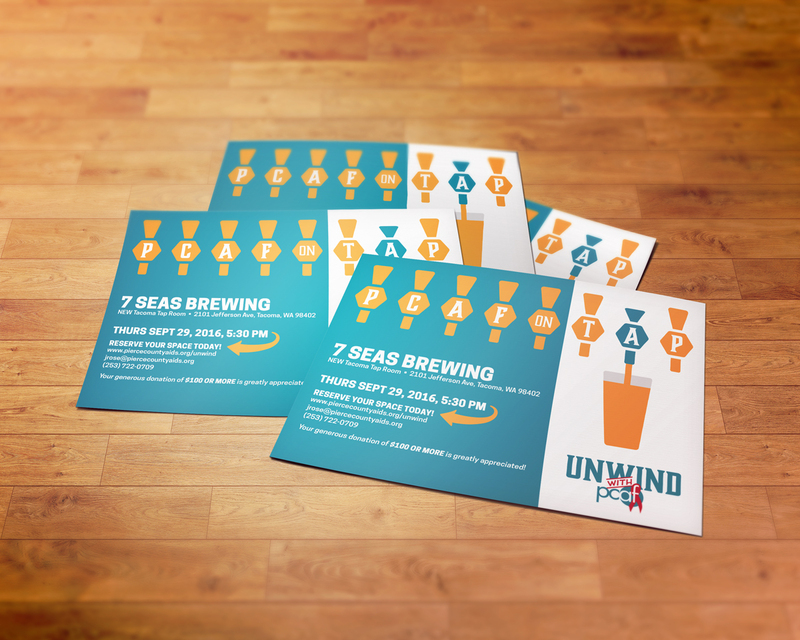 When creating the logo for Unwind, my primary goals were to convey the fun happy hour atmosphere of the event and for it to mesh well with PCAF’s recent rebranding, which was warm, welcoming, and modern. Indeed the best solution turned out to be to directly pair the Unwind logo with the PCAF logo, eliminating the need to brand any materials twice. The logo translates well to a simple black & white version for times when color printing isn’t practical. It’s also easily applied to any number of promotional items and collateral. In 2016 Unwind guests received a complementary pint glass with the Unwind logo, and in 2017 guests received a glass whiskey tumbler.